Welcome to Dreamscapes. A hidden meaning page. This painting is entitled, "The Union of Opposites" (Tibetan: mithun gyulgyal) and represents mythological dualities where competing pairs of creatures are combined to represent harmony. 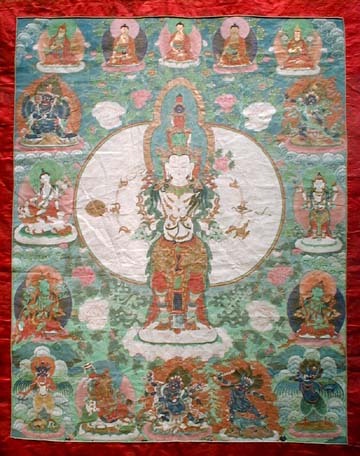 For example in this painting the snow lion (cheerfulness, clear and precise mindfulness) and the Garuda (daring, fearless, able to fly freely from all hopes and fears) are combined (top left). 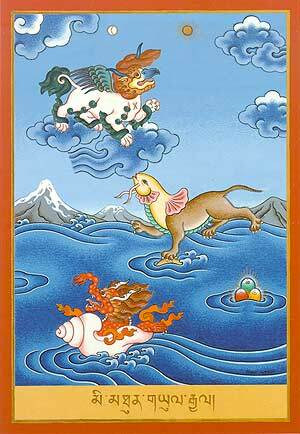 The Karmapa Dream flag has both outer and inner meanings. In the outer, the blue represents the sky, or heaven, while the yellow symbolizes the Earth with the wave being the Buddhaharma (the way of the Buddha) infused in both heaven and earth. In the inner meaning the blue represents the spiritual and wisdom (emptiness) while the yellow symbolizes the everyday world (see colors in the Dream Dictionary). The wave means the interdependence of the absolute and relative reality. This Tibetan Tanka (paintings that represent the Buddha) is entitled "The Buddha's Dream" representing the story of Buddha's enlightenment. This last illustration is Hindu and represents the God Ganesha (the Remover of Obstacles and Lord of Beginnings). I exhibit it here to show the symbolism inherent in all religious artifacts of the East. Both are used as a mechanical means for focusing the mind. Both are said to reveal the unconscious to the conscious. The dream is much the same in that its symbols are also used to reveal the unconscious. 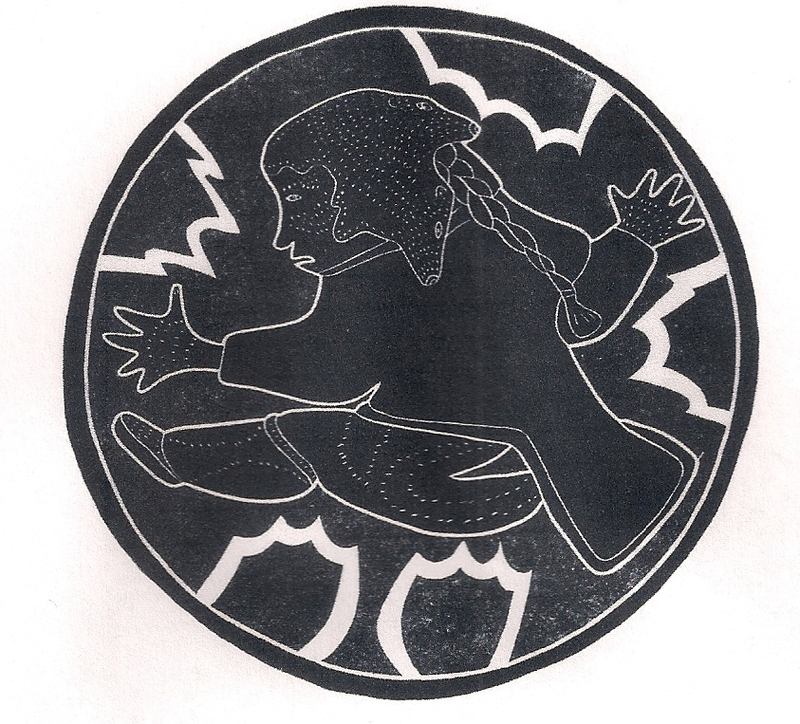 Basically this is a mandala and may be interpreted symbolically to be a Psyche being held within the magic circle of the mandala, what would be called the 'temenos', while being reborn into something new. It can be seen as a symbol for rebirth, change and transformation. Here the shaman is forced to come face-to-face with his unconscious. 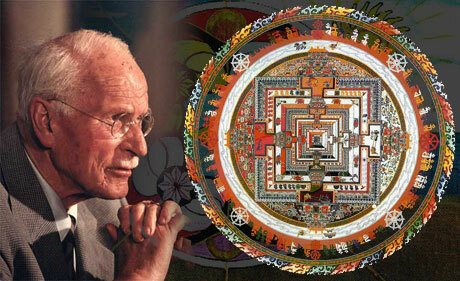 The mandala often plays the role of announcing the need for change within the dreamer's dream. He believed that they were "cryptograms" of the state of the self at the moment they were drawn. They were thought to bring order out of chaos.  For some these images may emerge at times in our lives when we are in psychic turmoil. Jung called them the "squaring of the circle" an alchemical reference to wholeness and completion. 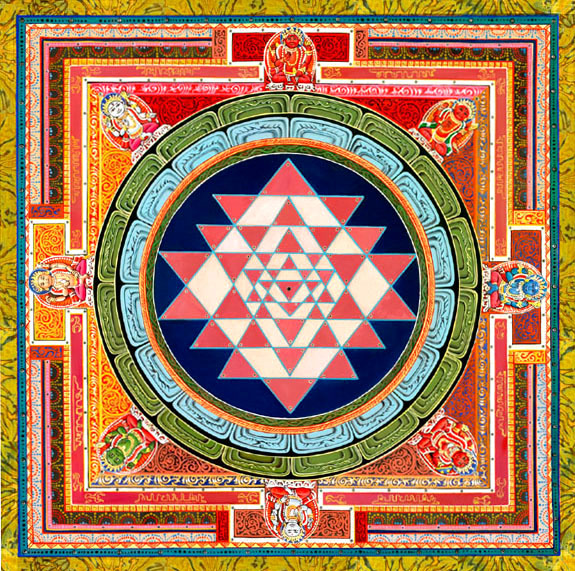 Ultimately the Mandala is a representation of the self and represents the path to the center of our being, and the individuation process itself. Note that these Mandalas relate strongly to the number four, the "quarternity" that was also strongly tied to the process of creating the Philosopher's Stone in alchemy (see article in the DreamDragon). 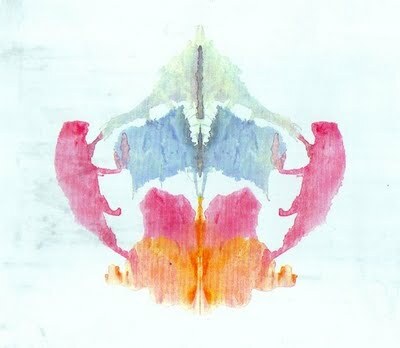 Some psychotherapists believe that if there are images of three that show up in a patient's dream or in their waking life, then there needs to be a fourth element lurking nearby to complete the transformation toward healing or toward understanding. Jung carried the four element concept into the idea of the four psychic functions– sensing, thinking, feeling, and intuiting (this was later coopted by Meyers and Briggs into a personality test). The beast in the center of this labyrinth represents our own hidden animal nature found within our unconscious selves. 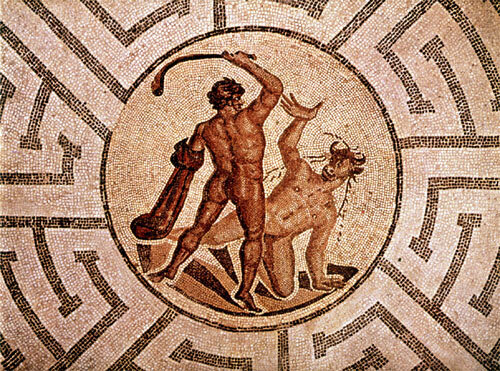 This is a mosaic of Theseus fighting the Minotaur and is symbolic of us all struggling with our own dark natures. As it is with Mandalas, Labyrinths are often used as metaphorical images for a map from the conscious to the unconscious mind. Finally, I submit the following modern mandala. 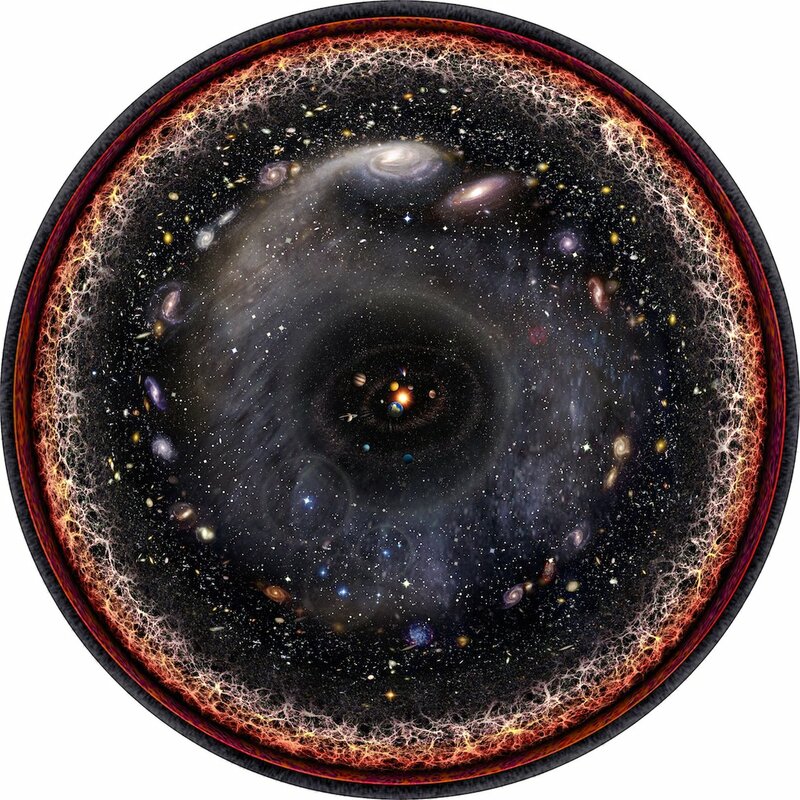 It's a graphic representation of the observable universe– a logarithmic versus a linear view. The Sun and Solar System are at the center followed by an outer ring of the Milky Way Galaxy with another ring of nearby galaxies then the rest of the cosmic web, the cosmic microwave background from the Big Bang and lastly the ring of plasma generated by the Big Bang.